Russell Wilson will become the first rookie to open the season as a Seattle Seahawks starter since Rick Mirer did it in 1993. The Seahawks opened on the road that year as well, versus the San Diego Chargers, and fell 18-12 in a game where Mirer went 20-27 for 154 yards, 0 touchdowns and 1 pick. He also ran three times for 36 yards. One of the biggest questions facing the Seahawks heading into Sundays opener versus the Arizona Cardinals is how Wilson will perform. Mirer is one rookie starter, but there have been many others. Below is a list of the best performances in NFL history by rookies playing the season opener. The list only includes quarterbacks that passed at least 15 times, since there was a lot of junk in there where guys threw 3-4 passes. The search was also limited to NFL players only. AFL players will not appear in the list. The first thing that jumps out to me is that 3 of the top 4 performances came from mobile quarterbacks. Tarkenton, Staubach, and Newton all are known for using their feet. However, none of them rushed for more than 22 yards in their first game. Newton’s game came last year against, you guessed it, the Cardinals on the road. He torched them for 422 yards, 2 touchdowns and a 110.4 passer rating, yet he still left Arizona with a loss after Patrick Peterson returned a 4th quarter punt 89 yards for a touchdown in his own rookie debut. That brings up the next point of interest. Four of the top six, and six of the top ten rookie quarterback performances resulted in a loss. A great first game by your young gun does not necessarily mean the team should expect a victory. That can be complicated by factors outside the box score. For example, many of these players were very high draft picks because their team was one of the worst in the NFL the year prior. That was the case with Newton’s Panthers who had been 2-14 just one season before. Seattle was in the hunt for a playoff spot last season, and won a playoff game two years ago. Wilson should have more talent around him than most of these past quarterbacks did. Andy Dalton was a good example of a quarterback drafted later who had a strong defense backing him up, and was able to walk away with a win on the road. Take a look at how steep the drop-off is after the top eleven players. Things get ugly in a hurry. 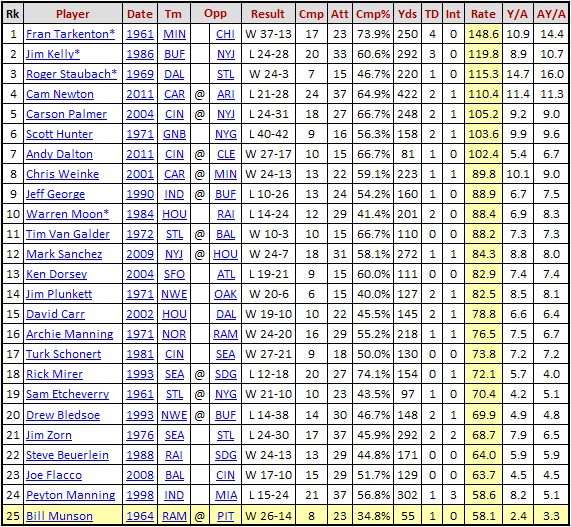 It is hard to believe Peyton Manning’s 58.6 passer rating is ranked 24th all-time for NFL rookie debuts. Manning threw for over 300 yards, but also found the opposing team three times for interceptions. It is worth noting there have only been 48 rookies to start at quarterback for an NFL team on opening day, and throw at least 15 passes. Five more names will be added to that list on Sunday. Manning was obviously not the worst of these rookie starters, and his poor game did nothing to deter what has become a Hall of Fame career. Three of the eleven worst rookie opening day performances belong to other great quarterbacks. Terry Bradshaw went 4-16 for 70 yards, no touchdowns and one interception. That worked out to 19.3 passer rating. Mathew Stafford had a 27.4 rating while throwing no touchdowns and three picks. Troy Aikman had a 40.2 passer rating and threw two interceptions. Bad first games are not death sentences for rookie quarterbacks. Wilson will be hard-pressed to match the show Newton put on in Arizona last season, but if he can even break the 80.0 passer rating, he would find himself among the Top 15 rookie debuts in NFL history. That’s a fair expectation for a player like Wilson.